Learn about buying, selling, and exchanging common hats and miscs. Guide: How do I buy hats? I want to buy a hat for metal, how do I buy hats? This is the hat banking page. Scroll down a little and you'll see all the bots. This is a bot. Click on it to see all the hats it has. Here you choose the hat(s) you want to buy. I've selected a Madame Dixie..
To the left you can filter your weapons if you for example only want to see Soldier or Pyro hats . To the right you'll see how much you'll have to pay for the hat(s). Now you'll see this. Here you can choose if you want to trade your hats for the hats you selected before. 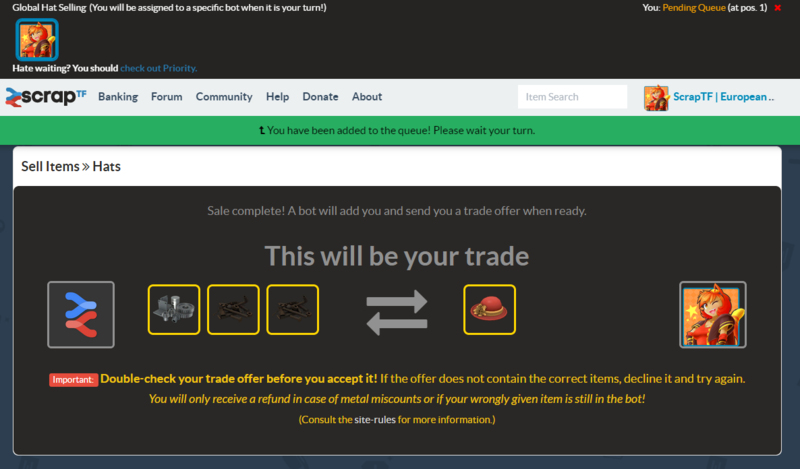 I want to pay a Refined and a Reclaimed for the hat so I don't select anything and hit the "Trade Now!" button. You're now in the queue to buy the hat(s) you selected. You might be in a queue for a minute or so. You can see what the trade needs to look like. 1 hat for my 1 Refined and 1 Reclaimed metal. 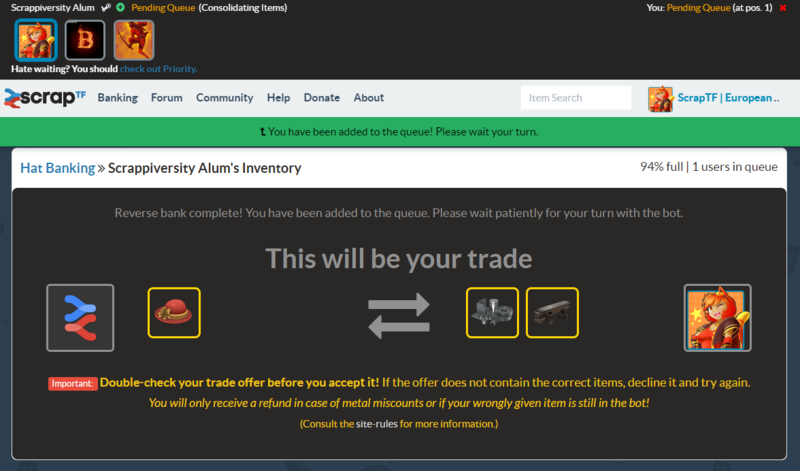 You've now succesfully completed a hat banking trade! Congratulations! Guide: How do I sell my hat(s)? I want to sell my hat(s) for metal, how do I turn my hat(s) into metal? This is the Hat banking page. Click on the "Sell Hats button to begin. Here you choose the hat(s) you want to sell. I've selected a Madame Dixie. To the left you can filter your hats if you for example only want to see Demoman or Medic hats. To the right you'll see how much you'll get for your hat(s). You're now in the queue to sell your hat. You can see the queue at the top of the screen. I'm currently in a "global queue" which is what you'll be in at the start. Then you'll be assigned to a bot to trade with it. You might be in a queue for a minute or so. You can see what the trade needs to look like. 1 Refined and 2 Scraps metal for my Madame Dixie. What does the option of buying bulk hats do? It allows you to buy a number of random craftable hats (you can pick/choose the number) which are worth 1.44 ref (may change during time) without the need of selecting them. Will the bots pay more for my expensive hats? Depends on the value of your hat. Bots will pay you more than the default craft hat price if their price is one or two ref higher than the average craftable hat. Do I have add or pay extra metal if I use a hat to pay for another hat? No! If you pay for a hat that you're buying with a hat that is in the same category on the main Hats page, you can 1:1 trade them. This means that if you're going to sell a hat and also want one the bots have, you can save yourself a bit of metal by swapping them! Does hat banking have a stock limit? Yes, it does. We have a stock limit of 100 units per hat. The hat that I found in the quick search isn't appearing! The site has decided so (list). The price of the hat is higher than it used to be, making it be out of the accepted price range. You can verify so by checking the prices in backpack.tf or checking the price that the quick search gives you. The expensive hat range has changed. A dev/owner has decided so. Or it can also be that someone else bought it before you. Why is the bot charging me more/less than 1.33? Different 'categories' of hats have different prices. Some of these are less than 1.33, and so you will be charged that much metal respectively. The bot may also charge slightly more if it has very few hats available to sell. It may also be that a member of staff has changed the price of hats. This usually happens when there is a sudden demand for large numbers of hats (such as people wanting to craft them together in the wake of a new TF2 update). The price is usually set back to normal after a few days. If you get offered less than 1.33 for a genuine hat then do not worry about it, it's supposed to be that way. Please, do not contact a staff member, make a thread in the forums or contact support about this. The bot isn't paying me what the site says I will get?! If that is still happening, then it's because you do not have enough metal and you aren't checking the trade carefully enough or it's because of the previous bug which still should be fixed at this moment. If you believe that it's the bug, then you should post about it in our forums. Why is the bot offering me less than the price of my hat? 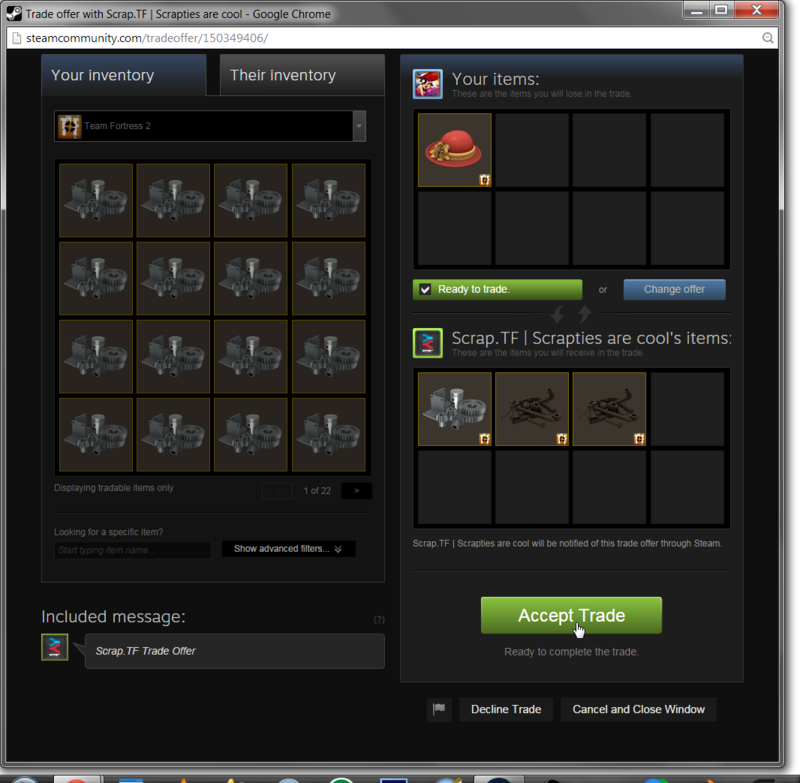 The bots pay a flat rate for each 'type' of hat, rather than the 'market value' of that hat. You can view the different categories and what is paid for them here. The bots may also change their prices slightly depending upon their metal/hat amounts, as noted in brackets next to the price. The hat that I am trying to sell is not showing up! 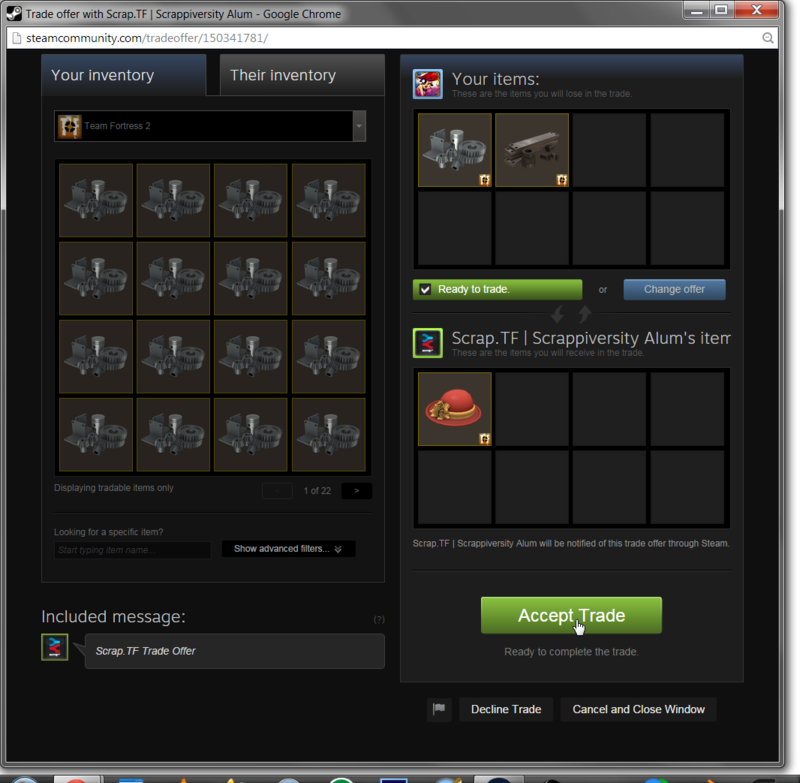 The hat that you are trying to sell is not tradable, does not have a price yet, or is too expensive (check backpack.tf). We have hit the stock limit of said hat. Hat banking's stock limit.